Fellow indie developers, Alice in Dissonance sent us a lovely congratulatory message for The House in Fata Morgana‘s English release! 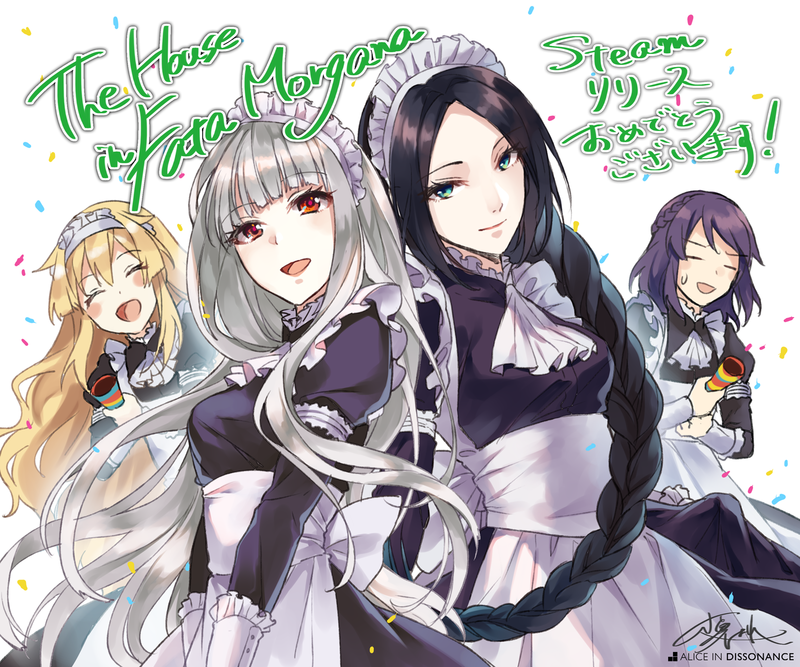 Congratulations on The House in Fata Morgana’s Steam release! I just felt like I had to show my support so I decided to draw something! I’m Konatsu Hare from Alice in Dissonance, by the way. The beautiful artwork was what first attracted me to Fata Morgana. I had been bracing myself for a really heavy tale, but I found myself drawn in by the finely crafted story and comfortable prose when I actually read it. Fata Morgana is the kind of story that could really only be told in the visual novel medium, so I hope you all give it a try to see that for yourselves! It’s quite humbling to be able to write a recommendation of this game. Novectacle has found their solid success way before ALICE IN DISSONANCE and I can’t seem to shake off this feeling of impertinence. Let’s set the premise shall we? The Japanese non-18+ market of Visual Novels in Japan can be summed up in two words: Nobody cares. Because of the rise in popularity of crowd funding and the general boom of Visual Novels in the West as of late, one might lightly assume––and not wrongfully so––that achieving success making a Visual Novel is not too far fetched of a goal. However, being able to ask for the initial help, let alone continuing funding from strangers, is a luxury that has been exclusive to the West for the past several years (and it kinda still is). These folks at Novectacle had no such luxury. Pushing an IP all on their own and not only making a masterpiece but a living off of a Visual Novel, solely reliant on the Japanese market is, without hyperbole, nothing short of a miracle. These folks have been doing that for the past several years and are still pushing strongly to keep making innovative and compelling games. If that’s not enough to convince you of your time, then I don’t know what will. “House in Fatamorgana” has resonated with tens of thousands of people in Japan and its continuing success reminds me of the roads that many of the giants of the past have walked such as Type-Moon and 07th Expansion (folks that started out at the biannual Comic Markets, as grass roots as it gets). To me, this market in Japan has been stagnant for way too long. We are in dire of need of something more, something visceral, raw, exceptionally emotional and most of all innovative. It’s time for something different folks. Let Novectacle and its founder, Keika Hanada, lead the way. « The House in Fata Morgana Now On Sale! This is fantastic! I love seeing companies that have a positive relationship with each other. It is really cool to see companies praising other companies’ games. Thank you very much for sharing this.